Peanut butter seems to cost a lot of money these days. Don’t you wish you could make your own at more than half the cost? Well guess what? You can! 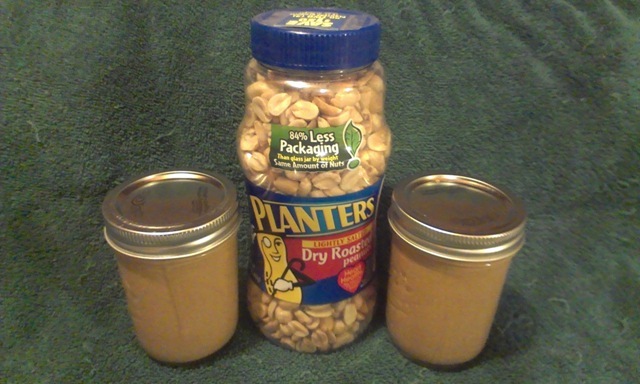 Today I bought a box of small mason jars and 2 tall 16oz jars of Planters Dry Roasted Peanuts. I was looking for no salted, but all they had were dry roasted, honey roasted and some other flavor that was spicy. Dry roasted was fine I guess. I added 1-16oz jar of peanuts to the food processor and blended the nuts until they were in chunks. I added 2 tablespoons of peanut oil and 2 tablespoons of brown sugar and 1 teaspoon of salt. I blended it until it was smooth. Although, it was very dry and I decided to just add a touch more peanut oil to make it more creamy than it was. I probably went overboard because it did get creamier, really creamier lol. Next time I’ll just let it blend until it gets creamy on it’s own. My partner tasted it and he said it needed more brown sugar, so I added 2 more tablespoons. It did make a difference. I like these little jars because if I want to make some peanut butter cookies, 1 whole jar is basically 1 cup, enough to make 1 batch of cookies. Next time I go to the store I’m going to buy the bottling kit so I can start making my own jams and applesauce. I could literally go crazy bottling jams and applesauce, but at the same time I know what’s in them so I know that I am eating healthier and saving a ton of money.